The struggle for sovereignty in Jerusalem has transitioned from the “Jerusalem of Above” – in the sense of the political summits of Oslo and Annapolis – to the “Jerusalem of Below,” in the sense of daily life in the city. The real limits to control and sovereignty are not determined in clandestine talks between unnamed high-ranking officials, but rather by demarcating the area of activity of the municipal street cleaner, the youth counselor at the local community center, the building inspector, the road engineer, the policeman and the social worker, who provide services for the residents and are clearly identified with the Israeli institutions. Governance and sovereign rule in eastern Jerusalem requires a quantum leap in the level of services provided by Israel, alongside effective community policing efforts. The contrast between the strong national and religious symbolism that Jerusalem (or al-Quds, by its Arabic name) holds for its Arab residents, on the one hand, and their accelerated integration into Israeli society, both in the city and elsewhere, on the other, has entangled them in a thicket of contradictions. Among the contradictions: A Palestinian national identity alongside an unprecedented demand for Israeli citizenship; stone throwing at the Hadassah Hospital on Mount Scopus but valuing the care that Arabs receive in its clinics and wards; protesting the enforcement of planning and building laws in Arab neighborhoods while calling for an increased police presence there to maintain public order; campaigning against any manifestation of “normalization” with Israel in tandem with a tremendous interest in learning Hebrew and an increasing preference for the Israeli rather than the Palestinian matriculation certificate; flying the flag of Palestine and spray-painting nationalist slogans in praise of Fatah on the walls of buildings, while expressing vicious criticism of the Head of the Palestinian Authority, Mahmoud Abbas, on the social networks. And, alongside the growing power of conservative Islamist forces in the public domain, there is also greater sexual permissiveness in the private domain and a growing laxness in the observance of family values and tradition. In this sense, eastern Jerusalem Arabs are at an historical crossroads, which ends their stance of sitting on the fence between the Palestinian Authority and Israel, bringing to a head a decision between the alternative senses of belonging. “Eastern Jerusalem” is the term applied for the neighborhoods within the municipal jurisdiction of Jerusalem that are beyond the 1949 armistice line (also known as the Green Line or the pre-1967 line). It is applied somewhat inaccurately from a geographical perspective, since it also includes territory north and south of the city. These neighborhoods cover about 70 square kilometers. In fact, the area of pre-1967 Jordanian Jerusalem was only 6.4 sq. km., in the Old City and its immediate environs. After the 1967 Six Day War, Israel annexed an additional 63.6 sq. km., consisting mainly of 28 Arab villages. The Arab population of the newly united Jerusalem in 1967 was about 70,000 (alongside the 197,000 Jews), constituting 26.5% of the city’s population. Residents of eastern Jerusalem have the legal status of “permanent residents,” which in practice is the same as that of foreign nationals who arrive in Israel and receive a residence permit. This status grants them the right to live and work in Israel (unlike the Palestinians of Judea and Samaria). It also entitles them to benefits under the National Insurance Law and the National Health Insurance Law. As permanent residents, they are eligible to vote in municipal but not in national elections. If they leave the country for more than seven years they risk losing this status. From time to time, they may be required to prove that the center of their lives is indeed Jerusalem to retain their status. A permanent resident who marries a person who lacks this status, planning on living together in Jerusalem must submit a family unification request. This phenomenon is found mainly in the villages in the south-east part of the city, where there are strong family and clan ties between the residents of the villages on the Israeli and Palestinian sides (for example, Sawahra al-Gharbiya on the Israeli side, and Sawahra al-Sharqiya on the Palestinian side). Permanent residents can apply for full Israeli naturalization. This requires them to swear allegiance to the state, submit proof that they do not hold any other citizenship (many residents of eastern Jerusalem hold Jordanian citizenship), and demonstrate some fluency in Hebrew. The permanent residency and the intermediate status it provides, on the one hand, and the dependence on social benefits (national insurance) and healthcare (Israeli HMOs and hospitals) on the other, is a key to understanding the circumstances of life for the Palestinians in eastern Jerusalem. Deep research studies and public opinion surveys conducted among them reveal that safeguarding their permanent resident status and remaining eligible for national insurance benefits and healthcare, rank high among the reasons for the Palestinians’ preference to live within the municipal boundaries of Jerusalem, even though they could probably find cheaper and better housing elsewhere. This group currently numbers some 320,000 persons (to which must be added about 50,000 illegal Arab residents); they constitute about 37% of the city’s population and 20% of the Arabs within Israel’s borders. Jerusalem is home to the largest concentration of Palestinian Arabs between the Jordan River and the Mediterranean (excluding Gaza). By way of comparison, the population of Ramallah is about 280,000 and of Nazareth, the largest Arab town in Israel, 75,000. Regarding religion, the majority are Muslims, with only a small minority of Christians (10,000-15,000). About 120,000 of eastern Jerusalem Arabs live in neighborhoods that lie within the municipal boundaries of Jerusalem but are on the other side of the security fence (constructed around Jerusalem between 2002 and 2007). These neighborhoods are marked by severe overcrowding and extensive illegal construction, to a much greater extent than the neighborhoods inside the fence. The fence has cut off the Jerusalem Arabs who live within it from Ramallah and the West Bank, and intensified their links to the employment, welfare, healthcare, and economic infrastructure of western Jerusalem, and consequently to the city’s Jewish sector. The Arabs of eastern Jerusalem feel trapped between Israel and the PA. They are the “rejected child” of “warring parents,” Palestinian and Israeli, each of whom devotes themselves to their other, “preferred” children. To this sense of rejection and detachment, one must add the sense of impermanency, stemming from the ever-looming possibility of the city’s division as an outcome of political negotiations and the consequent change in political affiliation. This article argues that after fifty years of transience, the “rejected child” is at the height of adolescence and wishes to challenge his parents. This process has generated on the eastern Jerusalem street an intense desire for “permanence” and a clear resolution of the issue of affiliation, whether to Israel or to the PA. There is an intense desire on the eastern Jerusalem street for “permanence” and a clear resolution of the issue of affiliation, whether to Israel or to the PA. The strive for an end to the transience embodied in the “intermediate status” (not in terms of its formal-political nature but in the components of its sense of belonging), is at the basis of the sharpening power struggles in eastern Jerusalem neighborhoods between pro-Palestinian elements and those seeking to realize their rights as equal residents vis-à-vis the Israeli authorities. These inter-communal struggles include physical violence, threats and intimidation, especially by supporters of the Palestinian side. The PA and Israel are waging a struggle by proxy for control of eastern Jerusalem, involving the local residents. A clear example of this is in the area of education. There is a struggle between parents’ committees that support the introduction of the Israeli curriculum for schools in Eastern Jerusalem with the aim of broadening their children’s educational and professional horizons, and parents’ committees affiliated with the PA who wish to preserve the Palestinian curriculum due to its national characteristics (even though its benefits for access to higher education and better employment are low). The motif of transience characterizes both the Palestinian and the Israeli sides. Israeli government policy vis-à-vis eastern Jerusalem Arabs has yet to decide whether it wishes to view this community as an integral part of Israeli society or as residual leftovers. Israeli government policy vis-à-vis eastern Jerusalem Arabs has yet to decide whether it wishes to view this community as an integral part of Israeli society or as residual leftovers. In recent years, the Jerusalem municipality has undertaken a major effort to reduce disparities in the eastern part of the city and to increase enforcement and governance levels, in coordination with and assistance of the district police. The government also recently passed two resolutions2, allocating a large-scale budget for Eastern Jerusalem, some of which is already being realized, for the benefit of the residents. 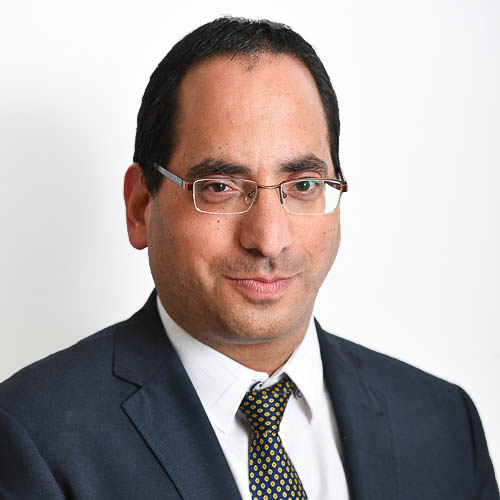 However, there is no dispute that for a significant improvement in the poor standard of living in most eastern Jerusalem neighborhoods, a vast investment of billions of shekels is needed in all areas of life, particularly infrastructure. It seems that the State of Israel has yet to realize that the struggle for control and sovereignty in Jerusalem, which was conducted in the past by summits and closed forums, is now managed on the ground. The focus of this struggle is over the shaping of the inner world of East Jerusalem Palestinian youth, torn between a growing number of colleges providing Hebrew classes and advanced professional training, and Fatah sports and cultural clubs with a revived budget by the PA. The struggle for sovereignty in Jerusalem has transitioned from the “Jerusalem of Above” – in the sense of the political summits of Oslo and Annapolis – to the “Jerusalem of Below,” in the sense of daily life in the city. The real limits to control and sovereignty are not determined in clandestine talks between unnamed high-ranking officials, but rather by demarcating the area of ​​activity of the municipal street cleaner, the youth counselor at the local community center, the building inspector, the road engineer, the policeman and the social worker, who provide services for the residents and are clearly identified with the Israeli institutions. The struggle for control and sovereignty in Jerusalem, which was conducted in the past by summits and closed forums, is now managed on the ground. Another sovereign act of the first order is in the area of ​​planning and building, especially in the approval and validation of neighborhood outline plans – such as the Silwan al-Wusta Outline Plan – which was approved by the local planning and building commission and has long been waiting for discussion by the Jerusalem regional planning committee. Another component attesting to the end of the intermediate, transient era and the drive for a decision is the issue of the civil status of eastern Jerusalem Arabs. Thousands of eastern Jerusalem Arabs apply for the status of a permanent “citizen” in place of their temporary status of “resident.” Yet the processing of their applications is slow due to the lack of qualified officials in the Population Authority, which makes them ponder why such a dramatic step on their part, pertaining to their core identity, is met by such a weak response on the Israeli side. Terrorist attacks and the wave of stabbing incidents led by eastern Jerusalem Arabs also expressed, to their own mind, the attempt to delineate the borders of the “Palestinian territory” in Jerusalem with blood and terror. Internal discourse among Jerusalem Palestinian youth on the social networks – alongside the glorification of the “Shahids” defending Al-Aqsa, which is motivated by religious feelings – also includes discourse of a political nature that emphasizes that deterring the Jews from reaching the city’s seam lines between East and West also demarcates the Palestinian area of Jerusalem. The intense effort on the ground over the past year to move on from the intermediate status has created a sense of urgency on the governmental side, both Palestinian and Israeli, to take a clear stand on governmental investment in eastern Jerusalem and upgrading the level of on-site enforcement and policing. This is the backdrop for the proximity of statements made in recent months by both Palestinian and Israeli governments on the launching of budgetary plans for eastern Jerusalem. The Palestinian side set the figure of 25 million shekels while Israel quoted two billion. In addition, the Israel Police announced a new security concept which advocates the enhancement of police presence in eastern Jerusalem and establishment of integrated policing centers – which will provide both policing and civilian community services to these neighborhoods. The past year has also seen a marked trend of the PA boosting its dimensions of sovereignty in the city. A reflection of this policy is the Palestinian government’s budgetary plan of a total of NIS 25 million (of which it is unclear how much, if any, will materialize) for eastern Jerusalem. This includes enhancement of the symbolism of building and renovating houses in Jerusalem by the PA (– in the Palestinian narrative, Israel demolishes Arab homes in Jerusalem); a focus on the Old City in an effort to protect its Arab residents and vendors from “Judaization” attempts; encouraging the establishment of competing sovereignty symbols to Israel’s, such as Palestinian hospitals and emergency medical services; and encouragement of higher Palestinian education over the Israeli one. (Abbas must be familiar with the high demand among eastern Jerusalem Arabs for Israeli matriculation studies). First, the perpetrators of the attack on the Temple Mount hailed from a region associated with the influence of Sheikh Ra’id Salah, leader of the northern branch of the Islamic Movement. Second, the power factors that drove the masses into the streets and led the struggle against placing metal detectors on the Temple Mount were members of the Islamic Movement and their Eastern Jerusalem counterparts, especially Sheikh Akrima Sabri and his supporters. In the events of the Temple Mount in the summer of 2017, one can see a fundamental difference between the Israeli and Palestinian sides. On the Israeli side, the government’s policy regarding placing the metal detectors was at the focus of a fierce, uncompromising professional (among the security forces) and public debate. On the Palestinian side, the events unified all the various streams and segments of the population and consolidated the sense of internal unity, which was severely impaired in recent years due to the Hamas-Fatah conflict and the geographic separation (Gaza – Judea and Samaria). As the events subsided, the Palestinians of Eastern Jerusalem felt a sense of victory that was probably their first in 50 years of Israeli rule. Moreover, in the eyes of the Palestinians, a new worldview was forged in the Palestinian struggle against the Israeli regime, namely, civil resistance (mass prayer in the streets as an example), which led to more significant achievements than those of violent resistance. The development of a new issue for struggle vis à vis the Temple Mount reflects the entry of the Jerusalem Arabs into the power parallelogram operating in the city. The Temple Mount is no longer a sacred site in relation to which decisions on related events are shaped by the Hashemite Kingdom and Waqf officials, but a site on which the Arabs of Jerusalem can have significant influence on events. The intermediate situation of eastern Jerusalem seems to be reaching its end for Israel, the PA, and the Arabs of eastern Jerusalem themselves. In other words, the intermediate situation of eastern Jerusalem seems to be reaching its end for Israel, the PA, and the Arabs of eastern Jerusalem themselves. The situation on the ground can no longer tolerate the current undecided amorphous existence and is striving to force all actors to take sides. Stemming from this development and against the backdrop of the political stalemate, the components of real sovereignty on the ground will be dictated by actions on the ground (bottom-up) rather than by top-down planning. Namely, there are local factors in place that are shape a political reality rather than a political rationale shaping the situation on the ground – as would have been expected to occur in such a central and sensitive place. Thus, if Israel wants to secure its sovereignty in Jerusalem, it must implement a widespread plan towards its citizens to boost its governance in the eastern part of the city by providing services and efficient enforcement and policing. If Israel wants to secure its sovereignty in Jerusalem, it must boost its governance in the eastern part of the city by providing services and efficient policing. Moreover, in the current situation, in which the formula of “two states for two peoples,” to which all pay lip service, is sidelined, the operational pattern of both sides is establishing facts on the ground. Therefore, the application of de facto sovereignty and governance on the ground is the core of political action in Jerusalem. On the Israeli side, “soft” governance, which is expressed in the provision of civil services, does not relate only to the world of distributive justice and equalization of living conditions between the different parts of the city, but is related to the very core of the political experience of the Israeli-Palestinian conflict. Anyone wishing to impact the nature of this conflict at its Jerusalemite core, and the reality of coexistence between Arabs and Jews in Israel, will no longer be able to marginalize the issue of the civic engagement of Eastern Jerusalem Palestinians. The more one tries to do so, the more will reality burst in, by force of the crises and challenges presented by the Eastern Jerusalem street. The application of de facto sovereignty and governance on the ground is the core of political action in Jerusalem. It should be clarified that alongside the political import of civic activity, one should not take lightly the civic, legal and humanitarian obligation imposed on all Israeli authorities to provide proper services to the approximately 320,000 Arab residents living in Jerusalem and who consider it their city. In recent years there has been significant progress in realizing this obligation (especially by establishing schools and developing road infrastructure), but there is still a long way to go. Turkey is injecting tens of millions of dollars in the areas of culture, welfare, education and sports in Eastern Jerusalem, while attempting to establish its status as guardian of eastern Jerusalem Palestinians against the “Judaization” of the city. The EU and UN auxiliary bodies also finance several projects in the areas of education, welfare, infrastructure, and so on, on a broader scale and at a higher level of visibility than in the past. The increased foreign presence in the heart of Israel’s capital touches the deepest chords of the issue of Israeli sovereignty in the eastern part of the city. Those who believe that Israel should not impose its sovereignty on eastern Jerusalem might welcome this foreign presence. However, they must also take into account the security implications of the murderous anti-Jewish ideology that some agents of this presence are instilling in the 320,000 Palestinians who live alongside 550,000 Jews. On the other side, those who condemn the foreign presence because it undermines Israeli sovereignty and/or due to its grave security implications must be aware that attempts to eliminate this presence, whether through security or diplomatic channels, are not enough. Some of these foreign organizations provide services required by the residents; their expulsion would require Israel to fill the void, and this would have major budgetary repercussions. In Israeli public discourse there are two main paradigms about eastern Jerusalem. The first advocates keeping the city united; the second calls for its re-division, with the eastern part of the city serving as the capital of the Palestinian state. The latter paradigm views partition of the city as part of a political process that would include territorial compromise by both Israelis and Palestinians. Two new plans for partition of the city have been floated recently. The first, promoted by former minister and MK Haim Ramon, calls for a unilateral Israeli pullback from the Arab neighborhoods, similar to the Gaza disengagement, and the construction of a wall between the two parts of the city. The second plan, which enjoys the support of various Palestinian elements, would create a municipal separation including the establishment of a Palestinian municipality to manage the affairs of the Arab neighborhoods, alongside the Jewish municipality that oversees the Jewish neighborhoods, but would not create a physical barrier between the two parts of the city. 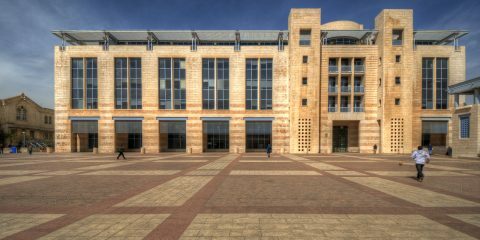 According to this plan, a joint committee or agency would coordinate between the two city halls, in conjunction with Israel and the Palestinian Authority. The consideration of these alternatives for eastern Jerusalem must acknowledge the physical proximity and strong links between the Jewish and Arab population concentrates of the city and the shared routine of daily life in domains such as transportation, employment, healthcare, consumption, and so on. A look at the map of the city makes plain that the Arab and Jewish neighborhoods are interlocked and sometimes only a few meters apart. What is more, some neighborhoods have a mixed population of Jews and Arabs, whether for ideological reasons (Jews) or to improve their quality of life (Arabs). The daily interchanges between the two groups have been facilitated by the road and public transportation networks that link Arab and Jewish neighborhoods. The best example of this is the light rail system, which has been subjected to a hail of stones by Palestinian rioters precisely because it is a symbol of the unity of the city. The light rail system has been subjected to a hail of stones by Palestinian rioters precisely because it is a symbol of the unity of the city. The demographic and geographical layout of the neighborhoods, along with the transportation network, makes the erection of an actual barrier between the two groups unfeasible or even impossible. This difficulty is what seems to have led to the idea of a Palestinian municipality to operate alongside the Israeli one. The strongest opposition to this proposal will be voiced by the Palestinian residents themselves. 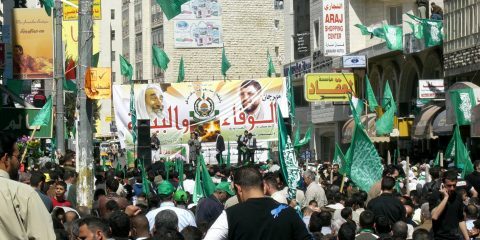 They view the PA as a corrupt and failed regime that has no commitment to provide decent services to citizens. Hence implementation of this plan might lead to an outflow of Palestinians to the Jewish neighborhoods that come under the jurisdiction of the Jewish municipality, creating housing pressure and a burden on the Jewish neighborhoods and their infrastructure. The demographic and geographical layout of Jerusalem neighborhoods, along with the transportation network, makes the erection of an actual barrier between the two groups unfeasible or even impossible. This hypothesis is reinforced by a survey of the Washington Institute for Near East Policy from January 2011. This survey polled the positions of eastern Jerusalem residents, posing the following question to its participants: Should the neighborhood in which you currently live move together with the other Arab neighborhoods to Palestinian sovereignty, would you choose to move to another neighborhood in Jerusalem or another city in Israel? Around 40 percent (!) of the responses were positive. Additionally, in light of the many difficulties that exist in the current coordination mechanisms in the civilian sphere between Israel and the PA in Judea and Samaria, where the populations lead separate but tangential living areas, it is predictable that in the case of Jerusalem, significant difficulties in coordinating the municipalities will arise where the shared life is at such intense and close levels. The municipal separation plan will also raise many difficulties in dealing with emergency and security issues in the delicate interface between the two municipalities. The other plan for partition of the city, the mirror image of the first, calls for a unilateral Israeli disengagement from the Arab neighborhoods and the construction of a physical barrier between them. In 2016, Haim Ramon founded the ‘Movement to Save Jewish Jerusalem’ which vigorously promotes this idea. Most of the villages incorporated into Jerusalem in 1967 would be de-annexed. A continuous security fence would be erected between the Palestinian villages and Jerusalem proper, to separate the Jewish neighborhoods from the Palestinian districts. 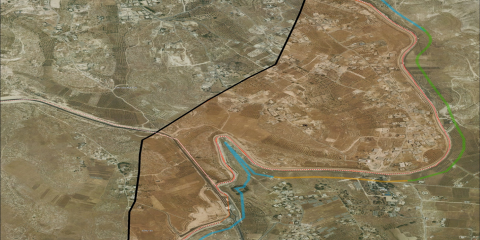 The IDF and other Israeli security forces would continue to operate in the de-annexed villages. The situation in the rest of the Eastern part of the city—the Old City, the Holy Basin, and the Jewish neighborhoods—would remain as at present. Some 200,000 Palestinians would thus be removed from the municipal boundaries of Jerusalem, leaving the city with a Jewish population exceeding 80%. The permanent-resident status of these 200,000 Palestinians would be revoked, removing the economic burden that the villages have been posing on Israel. The Knesset would enact the required legislation, and first and foremost an amendment to the Basic Law: Jerusalem the Capital of Israel. This plan has fatal flaws from the Israeli standpoint. On the security front, there is a risk entailed in handing over territories to the Palestinians without coordination of the transfer, with the inevitable boost to terrorist organizations and dissident Palestinian Authority elements. Building a barrier through Jerusalem would repeat the experience of the previous decade, which made life very difficult in the Shuafat refugee camp and Kafr Aqub, which in turn impact on the security levels in the nearby Jewish neighborhoods, especially Pisgat Zev. From the political perspective, the Achilles’ heel of this plan is its total disregard of the role and character of the Palestinian actor who would control the neighborhoods on the Eastern side of the barrier. The rise of Hamas on the eastern Jerusalem street raises the possibility that this force might gradually gain control of these villages, with all this implies from a security and political standpoint. As the change would not be carried out in coordination and communication with the Palestinian Authority, and because Israel would retain control of the Holy Basin, the PA, for its part, would oppose this plan and could be expected to stir up chaos on the ground. Partition of the city as part of a political accord seems the least likely scenario of all, given the current state of relations between the Israeli and Palestinian sides and the low level of trust and communication that prevails. The author’s “street smart” advantage in the analysis of the situation is a close acquaintance with the leaders and worldviews of the active Palestinian nationalist groups. This leads the author to believe that in any form of partition of the city, Israel must be concerned not only about the terrorist infrastructure that would emerge only a few meters from Jewish neighborhoods, but also about the currents that would dominate the educational, cultural, and welfare systems of the Palestinian political entity established. Children would be brought up with a deeply-rooted hatred of Israelis, glorification of the violent struggle against it, and the delegitimization of Israel’s existence as a Jewish state. The essential flaws identified in the various proposals for the city’s division make the need for a deep analysis of the current situation of the united city more acute, since we may assume that, given the current political constellation on the Israeli and Palestinian sides, it will continue for many years. Life in a shared city with no barriers between the two groups creates a real security challenge, especially in periods of religious and political tension, as exemplified by the knife intifada of the last few years, a challenge which the Jerusalem police managed to overcome. The experience of recent years has shown that success on the security front requires not only ingenuity by the security agencies but also the enlistment of all civilian elements in the effort. The intimate dialogue based on mutual trust with Arab leaders in the areas of education, business, and community life in normal times proved to be invaluable for moderating the violent friction between the two sides during times of crisis. Methods taken from the world of education, such as lengthening the school day and keeping children and teens within a protecting and supportive educational environment, are another proven way to lower the level of violence. Finally, the world of social networks, which played a major role in triggering the violence, also turned out to be a place for positive action. This involved the dissemination of updates and calming messages on the mayor’s Facebook in Arabic, which has around 30,000 followers, mostly eastern Jerusalem Arabs. It also involved the refuting of disinformation about the Temple Mount, to curb and counter the incitement propagated by many websites. An analysis of the civic aspect of the united city paradigm as it exists today, along with the adoption of a sincere and practical approach that recognizes both sides’ sensitivities, suggests that the experience of unity is partial at best for the Palestinian residents of Jerusalem. Constantly exposed to the immensity of the gulf between the two sides of the city and the disparate living standards of the two population groups, they feel alienated from the Jewish sector and its institutions. In recent years there has been a quantum reduction in these gaps and an improvement in the Arab residents’ standard of living in many domains, including education, social services, roads, and leisure time activities. But the gap remains vast and closing it would require another major increase in government investment in eastern Jerusalem. Here the exclusion of eastern Jerusalem from the substantial budget allocations of the five-year plan for the Arab sector in Israel—even though eastern Jerusalemites constitute 20% of all the Arabs under Israeli jurisdiction—cries out for attention. Israel should take steps to increase eastern Jerusalem Arabs’ sense of belonging to the city and the state. Based on this analysis, this author believes that the State of Israel should take steps to infuse more significant content than at present in the factors that work to unite the city, by means of actions that increase eastern Jerusalem Arabs’ sense of belonging to the city and the state. On the basis of the many conversations held with various prominent figures from among the Palestinian population, this author surmises that broad sectors of the Palestinian public hold a pragmatic attitude about the Israeli authorities, despite their Palestinian national identity. They see Israel not only as the culprit to be blamed for their predicament as individuals and as a community, but also as the only possible source for solving their problems and turning their lives around. Broad sectors of the Palestinian public hold a pragmatic attitude about Israeli authorities, and see Israel as the only possible source for solving their problems and turning their lives around. 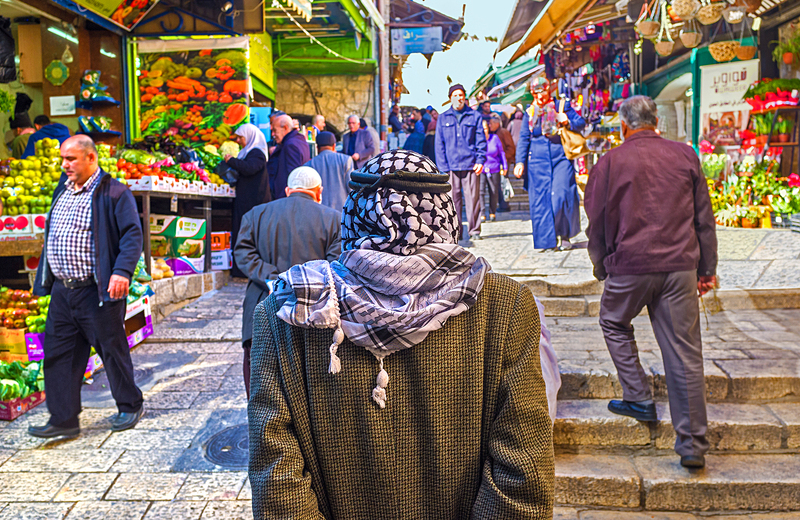 “Infusing content” into the united city is not simply a matter of increasing government budgets for the development of the Arab neighborhoods of Jerusalem. It also means adopting a more innovative line of thought and action in deeper content worlds that relate to the circles of identity of the Palestinians in eastern Jerusalem. For instance, simplifying the naturalization process for Arab residents of Jerusalem, along with increased access to Israeli matriculation tracks and Israeli institutions of higher education, could not only alleviate their sense of frustration and alienation but also encourage a sense of belonging. There are many Palestinians in eastern Jerusalem who have reached the instrumental level of exploiting the advantages offered by the western half of the city and would now like to participate in Israeli society at a deeper level – learning from it, integrating into it, and even encouraging the growing number of eastern Jerusalem teenage boys and girls who perform civilian service after high school in eastern Jerusalem. Israel’s encouragement of this trend has strategic implications not only for the unity of the city but also for the mid- and long-term security perspective. In another decade or two, the teenagers who engage more deeply with Israeli society today will be the moderates and pragmatists who restrain Palestinian society. During the spate of violence in 2014-2016, teachers and principals went out into the streets to retrieve their pupils and to urge them to curb their emotions and avoid harming innocent persons, both Arabs and Jews. In another decade, perhaps these teachers will be joined by businesspeople, community activists, and cultural figures who would endeavor to introduce mutual respect and sensitivity to the turbulent reality of Jerusalem. This study is an expansion of an earlier article I published with Ben Avrahami, “The Residents of East Jerusalem at a Historic Crossroads,” Hashiloach, Vol. 4, May 2017. Government Resolution No. 1775, 29.6.2014; Government Resolution No. 2684, 28.5.2017. The author is grateful to his colleague Ben Avrahami for sharing his insightful thoughts on the July 2017 events on the Temple Mount.